What do you think is St. Ann's greatest asset? I’ve always found it odd that some Catholic schools act like elitist prep schools – as a Catholic myself, I thought Catholic schools were designed to educate the entire person and to promote social justice – not to promote exclusivity. There is zero snobbery at St. Ann School and an actual commitment to the students and community. I don’t want my children to be in a school where they’re bullied by the economics of their peers, nor do I want them to be completely surrounded by other blonde-haired, blue-eyed children: that's not how the world works.My girls see the Catholic commitment to service through the church and school’s commitment to those less fortunate, even through the after-school programs. They live how to treat others every day of the week, not just on Sundays. St. Ann’s faculty and administration KNOW MY CHILDREN. The principal can regale me with specific stories of my kindergartener’s antics, and during a phone call, the school secretary told me she loved my girls’ recent haircuts – I mean, where else would people other than their direct teachers know or notice that about my children? Parents are informed of issues before they become issues. There’s a definite sense that the teachers own their classrooms and are committed to the curriculum. There’s no drama or ridiculousness that I hear my friends speak of within the public school system. There is actual, practiced faith every day. I don’t see non-Catholic children being forced to practice Catholicism or to subscribe to a religion. I see the faith being taught as a way to live and interact with everyone – with kindness, consideration, and integrity. I’m very open-minded and can even understand why public schools prohibit saying “under God” with the pledge of allegiance. That being said, nothing can compete with seeing my children freely practice their faith in the classroom. As an added bonus, I don’t have to run my second-grader all over creation for faith formation to prepare for first communion, as it’s done in the classroom. If asked to recommend St. Ann to a prospective family what would I tell them to convince them to choose St. Ann? Our students are the best children in Cumberland County! We have the most unique group of students and they are a family. If you put our school up against ANY school, we would win because these children are a family. They try to put others before themselves. They work together to achieve the best. They do not put others down to make themselves look better, they look better because of who they are! I have been in and around the school many times at random times. These students take pride in their acts of kindness and choosing to live a better way. We do not have bullying or taunting or hateful attitudes toward each other. IF anything they encourage each other to do better. They compete to be the best in the academics but push each other to their best! The day my children leave St. Ann, I know they will leave with a wealth of knowledge, a kindred spirit and a heart full of love! When did we know we made the right decision in enrolling our children here? On one specific occasion, I remember I had to pick my son up a little early from their after-care program. I arrived only to find out, that my son was in his classroom with his teacher working. She felt because my son had struggled, in class with work that day, she needed to make sure he understood that day’s school work. She went to after care, and took him under her wing to help him. She took the time out of her own personal life to help my son. This is the attitude of all our teachers! I cannot ask for a better group of men and women to teach my children! Why did you choose St. Ann School for your children? I chose St. Ann's because of the proximity of the school to my job. I asked several people that worked for the city whose children attend or previously attended St. Ann's and received high recommendations. My granddaughter was removed from public school because she was not thriving in that environment, she was unable to focus on school work and hated going to school. She was performing below grade level and it was suggested that she repeat 2nd grade. I felt at that point the school had given up on her. Although I agreed with the teachers that she was not performing at an acceptable level at school, I knew that she could, as long as I sat beside her and worked with her through her assignments. She was unable to work independently or maintain focus. I knew the problem, but was unable to fix it. I contacted learning centers and people who used learning centers in the past. I figured if I were going to put that kind of money in a learning center with no guaranteed results, I may as well put her in private school with a smaller classroom environment. Her progress started slow, but I have seen a complete turnaround in her attitude about school. She loves going to school. Her grades have improved tremendously, and she does her homework without me telling her to. Even if I ask to help her, she says she can do it. St. Ann's has been the best investment I've made in a long time. I certainly appreciate the scholarship assistance and will do my best to keep her here until she graduates. There are so many great assets, but I think that keeping the parents informed through the website possibly tops the list for me. I would definitely recommend St. Ann's. Like I said, my granddaughter was put into private school to keep from being lost in the public school system and we made the right choice. 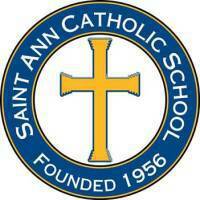 My children have been at St Ann Catholic School since 2011 and have thrived in the academic environment. The small class sizes and dedicated teachers have been great and it gives my kids a chance to excel academically as well as allow them to practice their faith as a part of the daily curriculum. The school also enhances their sense of responsibility to the community by giving them the opportunity to work service projects and do volunteer service to the Neighborhood Youth Center. I really like the genuine family and community spirit that is portrayed at this school and parish. We have been part of the SACS family now, for the past 10 yrs. We have seen our kids flourish in this school. We were drawn to the school, by the small class sizes, the catholic education and a Spanish program since kindergarten. The school has in character what it lacks in appeal. The teachers and parents are devoted to the highest standards in education, as well as, a deep commitment to nurturing the students in the catholic faith and catholic lifestyle. Discipline is of the utmost importance and it is evident in the behavior of the children in and outside of the classrooms. The teachers are very receptive to the parents and keep them up to date with classroom events and issues. The music program is excellent, and they have plenty of extracurricular activities to be part of. St. Ann's serves as haven to so many military families, as a former solider, I can attest to that. The faculty is well aware of the challenges that affect our military families and are very supportive to the children during difficult times. SACS has proven invaluable in the formative years of so many students time and time again. Our oldest is now in High School and is having no problems, the base that SACS gave her has made her transition easy, she is excelling in her courses and her character has not waivered when challenged by usual teen issues. We believe that this little school has contributed its share in her success. Hemos sido parte de la escuela St. Ann por los pasados 10 años. Hemos visto a nuestros hijos crecer en esta escuela. Lo que nos atrajo de la escuela fueron los grupos de clases pequeños, la educación cátolica y el programa de español desde los grados primarios. La escuela tiene en caracter lo que le falta en apariencia. Los maestros y padres están comprometidos a los más altos estándares en educación, así como un compromiso profundo al desarrollo de los estudiantes en la fe cátolica y el estilo de vida cátolica. La disciplina es muy importante y lo cual es evidente en la conducta de los ninõs dentro y fuera de los salones de clases. Los maestros son muy receptivos con los padres y los mantienen al día con las actividades y situaciones en el salón de clases. También tienen un programa de música excelente, y participan en muchas actividades extracurriculares. St. Ann sirve a muchas familias militares, como soldado puedo dar fe de esto. La facultad está muy conciente de los retos que enfrentan nuestras las militares y son un gran apoyo para los niños durante tiempos difíciles. SACS ha resultado invaluable en los años de formación de muchos estudiatnes, año tras año. Nuestra hija cursa ahora la escuela superior y no ha tenido ningún problema, la base que SACS le brindó ha hecho su transición fácil, ella está sobresaliendo en sus clases y su caracter no ha dudado cuando se le han presentado situaciones y retos comunes de adolescente. Creemos que está escuela ha contribuído mucho en su éxito. Cheers to the 147 students, the faculty and the parents of the St. Ann Catholic School family. “Enter to learn, depart to serve” is more than a school motto. It’s practiced and reflected in the classrooms and the community. How fortunate we are to have a nationally accredited school that offers a safe, structured and challenging environment to students of all faiths. Character is not part of the curriculum; it’s the product. Well done, St. Ann’s. Cheers to the Saint Ann Cahtolic School faculty, staff, parents, and students as they conclude year 56 in the school’s storied history of service to Cumberland County and Fort Bragg. With all the recent discussion of charter schools and where the money goes, it’s important to note that we already have a nationally accredited school, (reaccredited this year), consistently demonstrating academic achievement and community service at a fraction of the per student costs discussed. Our granddaughter has been part of SACS for the past four years, and she has been academically challenged, safe, and happy with four outstanding teachers. We couldn’t ask for more. Cheers to Rene Corders and her staff at St. Ann Catholic School for the most fabulous year my grandchildren have had since they started school. Thanks.